According to a report, the Hindu Kush Himalayas, which support 25 per cent of the world’s population, are set to lose a big chunk of glaciers by 2100. 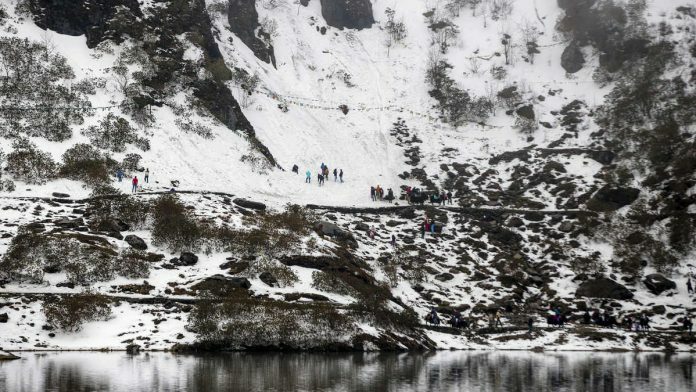 Bengaluru: The best-case scenario is that the Hindu Kush Himalayan region, which supports 25 per cent of the world’s population with its rivers, will lose one-third of its glaciers by the turn of the century. According to the Hindu Kush Himalaya Assessment, the Hindu Kush Himalayas, the origin of 10 major river basins, is unlikely to beat the ravages of global warming even if the world fulfils the temperature targets set at the Paris climate summit, to restrict warming this century to less than 2 degrees Celsius above pre-industrial levels. If the world overshoots the limit, the report states, the region will lose over two-thirds of its glaciers. Either way, by the year 2100, most of Asia would face an unprecedented climate crisis owing to the continent’s dependence on the region. The Hindu Kush Himalaya Assessment released this year is one of the most comprehensive studies on mountain warming and the effects of melting glaciers in the Himalayas. It involved observations and collection of data for five years and is authored by over 200 people. Another 300 researchers, experts, and policymakers from 22 countries chipped in with inputs, with 100 authorities all over the world reviewing the report. The primary editors are Philippus Wester, Arabinda Mishra, Aditi Mukherji, and Arun Bhakta Shrestha of the International Centre for Integrated Mountain Development (ICIMOD), Kathmandu, Nepal. Studies have shown that global temperatures are set to rise by 1.5 to 1.7 degrees C above pre-industrial levels before the end of the century if the most effective preventive measures are taken. If not, they are expected to cross 2.5 or 3 degrees Celsius. If greenhouse emissions continue at their current rate, the Hindu Kush Himalayas will see a temperature rise of 4.4 degrees C, causing over two-thirds of glaciers to melt, according to the report. Himalayan permafrost — permafrost is soil, rock or sediment that is frozen for more than two consecutive years — is not fully understood, like many colder regions on earth. However, just like in the Arctic and the Antarctic, the Himalayan permafrost has also seen melting. The lower limit has already risen between 100 and 300m in the mountains. The rising water level enables more invasive species to thrive, killing the local ecosystem. Retreating glaciers encourage more human encroachment into fragile areas. While tourism and real estate impact the economy beneficially today, exploitation can damage the ecosystem, causing cascading effects. Water from the Hindu Kush Himalayas is used today by a major portion of Asia, especially Afghanistan, Bangladesh, Bhutan, China, India, Myanmar, Nepal, and Pakistan. These countries alone make up over a quarter of the world’s population. The peoples of these nations use the water of the glaciers, directly or indirectly (summer-melting glaciers feed rivers, which is followed by precipitation), for not just consumption for agriculture, drinking, and domestic use, but also for power generation. Water from the Himalayas is consumed most for agriculture. This water comes directly from snowmelt and streamflow. Because the water supply varies from season to season, agricultural patterns in Asia follow the water cycle of the Hindu Kush Himalayas. A disruption would take decades or even centuries to stabilise, and could affect not just the economy but also food access for over two billion people. Changing agricultural patterns have already caused ecological damage. Cultivators in the eastern Himalayan regions are adopting either settled agriculture or growing more cash root crops on sloping lands. Cultivation on sloping lands without the implementation of soil and water conservation measures has led to soil erosion and the degradation of ecosystems. In the upper Indus basin, canal infrastructure built for the intake of glacial melt from the mountains has become useless due to retreating glaciers. Rebuilding the entire infrastructure is proving to be a costly proposition. Food habits are also heavily dependent on the environment, naturally, and changing environmental conditions are already putting the mountain population at risk of starvation and malnutrition. Everything is complicated by air pollution. The report states that while pictures of white peaks against a blue sky can project an image of pristine air quality, the reality is quite different in the populated parts of these fragile mountains. Three cities in the Hindu Kush — Peshawar (Pakistan), and Mazar-e-Sharif and Kabul (Afghanistan) — are already listed among the World Health Organisation’s 20 most-polluted cities. 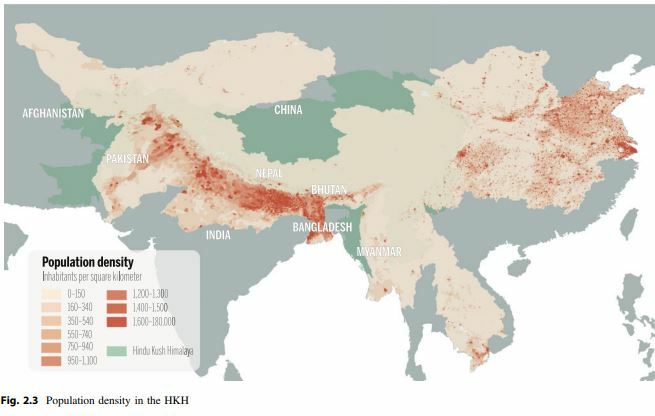 Vehicular emissions in 12 other cities – Allahabad, Patna, Dehradun, Delhi, Luchnow, Ludhiana, Peshawar, Amritsar, Rawalpindi, Agra, Jaipur, and Narayangonj in Bangladesh – have consistently been recorded at ten times the permissible limits, thus contributing to higher temperatures in the Himalayan region. Loss of glaciers also increases the risk of flash floods and landslides, prompting governments to focus more on disaster preparedness. A possible consequence of frequent disasters is increased conflict over natural resources. According to the report, this will mean that “institutional, political, and overall governance systems will be weakened and unable to function well at local, national, and regional levels and will fall short of global expectations”. Unplanned urbanisation is expected to increase, causing a loss of biodiversity, which could then trigger food scarcity. As with every such problem, the proportion of impact and suffering would be of a much greater magnitude among the marginalised and poor communities in all countries. There will be increased migration and a decrease in average mental health in all these developing nations, leading to increased suicide rates, states the report.